Aedephron pallens Tepper, 1883, in Smith, Trans. Amer. Ent. Soc., 10: 215. 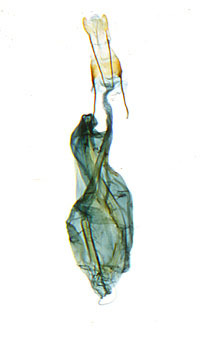 Omia nesaea Smith, 1893, Insect Life, 5: 332, figure 4 adult. Diagnosis: Nocloa pallens is the sister species of rivulosa despite the superficial disimilarity of the two. The general color of pallens is a very washed out olive green. The only significant maculation is a strong olive green medial line. 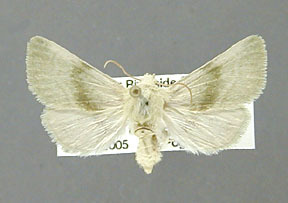 The hindwing is white without any dark scaling except in scattered individuals. 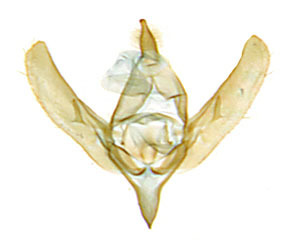 The male genitalia of pallens are close to those of rivulosa, but on the whole stockier. The uncus is shorter and the clasper of valve shorter and thicker. The valve is narrower in pallens than in rivulosa. In the vesica of the aedoeagus the spines of both spines group tend to be longer and thinner than in rivulosa. 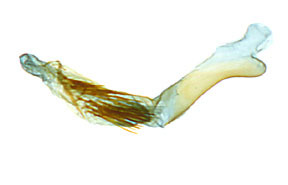 In the female genitalia the ovipositor lobes are not as long as in either rivulosa or plagiata and in particular the apices are not pointed as in those two species. Wing length: mean = 11.24 mm, standard deviation = 0.36 mm, n = 10. The adults of this species are spring fliers with approximately the same flight period as in rivulosa, although there is some indication that the species flies slightly later than rivulosa. Distribution: This species occurs in the deserts of southern California, westward into most of southern and western Arizona, although the species is not common in the more eastern parts of southern Arizona. Nocloa pallens has been taken as far north as Pyramid Lake in northwestern Nevada. The species also occurs in Baja California del Norte in Mexico. There is no apparent sexual dimorphism. The strength of the medial line is the only variable feature of this moth.